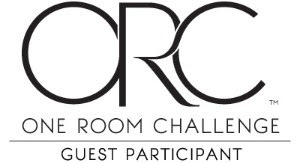 It was so exciting to participate in the Fall 2018 One Room Challenge these last six weeks. It was a great learning experience and the push we needed to give this space the attention it deserves. We set out to create a master bedroom that would become a retreat after long work days and weekend home projects. With a modern minimalist design in mind, like other spaces in our home, we got to work planning. One of the main goals was to makeover the space on a tight budget reusing pieces that we have collected over the years. While for the most part we stuck to the budget we made minor adjustments throughout the process and compromised on several elements. Now let's take a look back at where we started! The room had become a catchall for all things we didn't know what to do with. On top of it there was not enough evening lighting and no window treatments for privacy. Not to mention, marker scribbled across the wall. It was a drab space that needed so much attention. With lightweight window treatments and fresh light grey walls we were able to compliment all of the natural lighting. We have such a small space to work with and wanted to make sure we made it feel as large as possible. Additionally, we brought in a matching brass table lamp from our living room for added symmetry that the space otherwise lacked. One thing we had a hard time deciding on was an accent color. 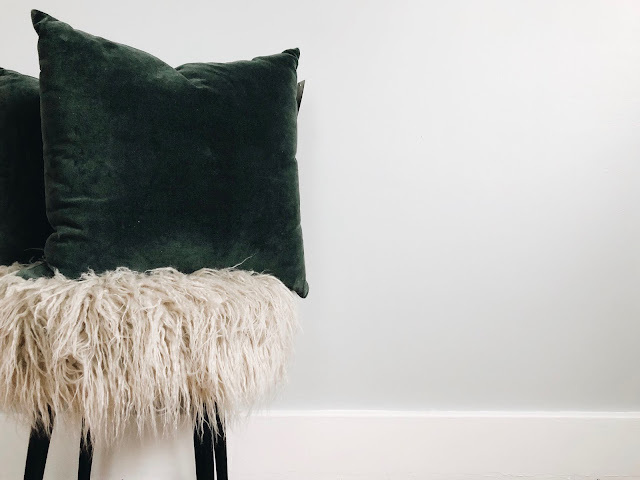 In the end, we played off of the greenery and added forest green velvet throw pillows for more dimension and a pop of color to otherwise all gray room. We have slowly been adding more and more greenery to our home and knew we would like a plant or two in our new space. We chose a snake plant due to its forgiving nature with medium amounts of indirect light as well as its air purifying powers especially at night which has been said to aid healthy sleep habits. Perhaps one of my favorite decorative and functional accents is our Terralite tri-wick Bourbon Cedar candle. Its modern design and amber glass add a sophistication and I love the flicker of candle light in the evening. Not to mention the aroma is absolutely heavenly! The last addition to our room was a beautiful faux fur stool that was a last minute purchase. 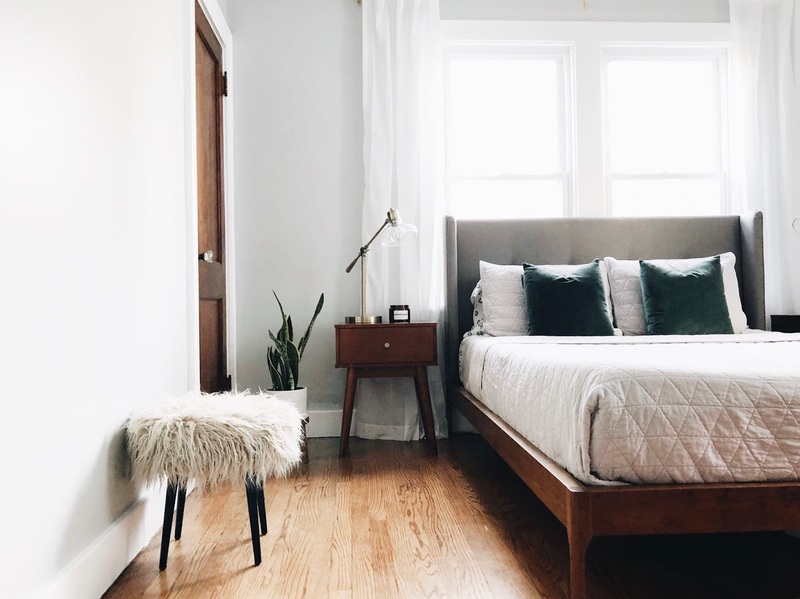 With plans to add a full length floor mirror I wanted a small stool to flank the mirror and be a resting spot for putting on shoes, laying out an outfit for the day, or even for our throw pillows when the bed is unmade. It is seriously amazing what everyone was able to accomplish in six short weeks. I am so excited to check out each of the Featured Designers and Guest Participants to take a look at their fresh spaces! beautiful serene bedroom! love the touch of color in the velvet. I love all the texture you brought in. Beautiful space. My bed is in front of a mirror with a wooden platform as well. I don't have a headboard but it feels like something is missing. After reading this post and seeing your pictures I'm thinking a headboard might be what it needs. Thanks for the inspiration. Such a beautiful outcome and space! The fur stool adds a lovely pop of texture. Well done designing a relaxing bedroom. It's beautiful!! Love those colors! So peaceful! What a peaceful room! I love the improvements. Hi! this is amazing. Where is the headboard from?